Taken at Hoeford depot on 30/03/69 having been recently transferred from City of Oxford where it had been No H972 this photo shows newly painted Provincial No 60 an LD3RA AEC Regent V with a Park Royal H37/28R body registration number 972 CWL delivered to COMS in December 1957. As a fan of the AEC concealed radiator and the AEC marque in general I find this and the elegant 30ft long Park Royal body an irresistible combination, the only way the effect could be improved would be for it to be in the original superb Oxford livery. This was taken on the same occasion as my posting of the Guy Wulfrunian. Very nice shot Diesel Dave. I too am a fan of the Regent V in all its forms and this is a most handsome version. It would indeed have looked the bees knees in City of Oxford livery, but at least in your photo it’s paintwork looks fresh – probably just repainted out of Provincial’s distinctive ‘jade’ green livery. (Don’t ask me the shade as I haven’t a clue as to what is was officially called!). 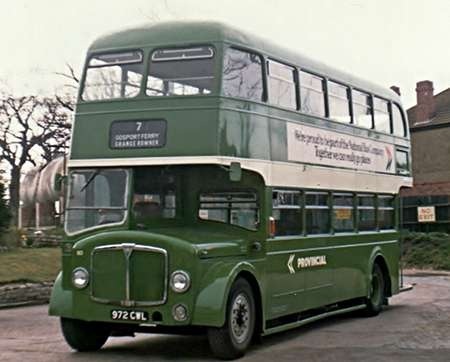 The NBC leaf green and white also seems to emphasise the length of the AEC nicely, which brings me to the date of the photo Dave, as NBC corporate livery didn’t make its debut until late 1972 I’m afraid. The Regent is wearing the original white ‘Double N’ arrowhead alongside the fleetname. This was replaced some years later by the red and blue arrowhead within a white square. Sadly I did not get to know the Provincial fleet until the early ‘eighties, by which time the fleet was standardising on the Leyland National. Mind you I was fortunate in seeing Provincial’s Bristol-ECW RELL in the wonderful ‘Anniversary livery’ in Gosport a few times while staying with friends, which gave a tantalising glimpse of life before leaf green. Very nice view, Dave. Thanks for posting. As the NBC corporate image was introduced in the summer of 1972, I don’t think the stated date in 1969 is correct. The "jade green" originally used by Provincial was… "Provincial Green"! 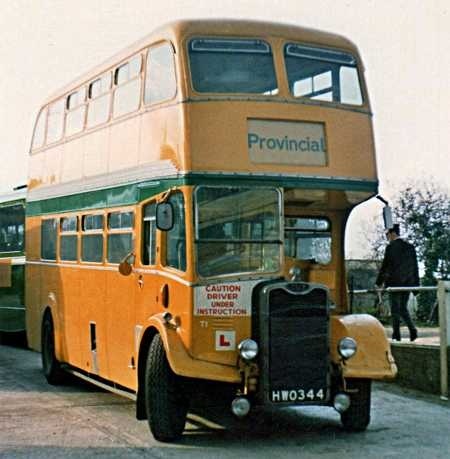 When Provincial 35 (’36 Regent BOR 767) first came into preservation in 1969 and needed a repaint, Dulux were able to call up the code and make the correct shade of Dulux Coach Paint – for the first time in many years. Provincial later turned to a ‘stock’ colour (I don’t know the details of this) which was very similar, but different enough for some enthusiasts to say that the colour on 35 was ‘wrong’! Very low seating capacity for a thirty foot double-decker, you would normally expect a bus of this size to be H41/32R. Must have had excellent legroom, unlike some modern buses! Yes, Don. That very discussion was included in members’ comments in respect of my contribution on the Hants & Dorset (ex Oxford Via Provincial) 975CWL. I suspect that the date is closer to 1973/4 as I seem to recall that 975CWL was in use by Hants and Dorset around then and may have been transferred around the same time. All the Aldershot & District Dennis Lolines had 68 seat bodies by East Lancs, Alexander and Weymann, and were superb vehicles to ride in (and to drive). As Don suggests, modern buses with their closely spaced hard plastics "shaped" (but not to my contours) seating are excruciatingly uncomfortable. 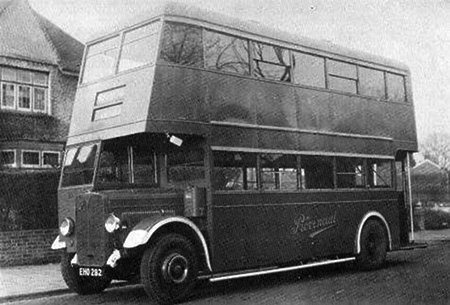 These buses were known as ‘Queens’ by their Oxford crews due to their sheer size. I seem to recall that the relatively low seating capacity had something to do with local union agreements, but I stand to be corrected. Sister bus H975 is preserved awaiting restoration. HWO 344 was a 1949 Guy Arab III with Duple L53RD body, in the fleet of Provincial, Gosport & Fareham. She’s been relegated to duty as a training vehicle and is seen outside the Hants & Dorset depot in Southampton on the same dull lunchtime as my view of the Southern Vectis Bristol Lodekka KDL 414 in March 1974, which was published a few weeks ago. She is an exile from Red & White (L1949 in their fleet) and is of course a sister vehicle to L1749 which features in the excellent ‘Gallery’ by Ken Morgan titled Red and White Guy L1749. I was pleasantly surprised to see the photo of the Provincial Duple bodied Guy Arab III trainer T1 as I had recently been looking through some of my old photos which included a photo of the same bus taken in the early 70’s at the Provincial Hoeford garage. Nice view, Dave! Brighter than mine, of course, since it was taken in sunshine. It’s always seemed a pity to me that there is no fleet name on the side of the vehicle. It did have its own identity, though; the minute T1 amidst the signs! I wonder how many trainers they had. Chris, so far as I am aware, there’s only ever been one trainer in use at a time. The last I recall seeing was a Bristol FLF (EMR 295D) ex Wilts & Dorset, and it didn’t seem to have a T prefix to the fleet number. It did, however, have the Provincial fleet name in NBC style. Doubt exists about the vehicle chassis type, but here is the story as of now. In 1943, Mr Orme-White carried out his first (of many) vehicle re-constructions, involving an AEC Regal I (although recent research suggests it was a Regent I chassis), purchased from the War Department with the registration DK 7791. The original source of the chassis is unknown. Provincial re-conditioned the chassis, fitted a 7.7 litre AEC engine and got Reading’s of Portsmouth to body it. It was their first double deck offering, of utility specification and painted wartime grey. It was also re-registered EHO 282 and numbered 15. In 1952, it was rebuilt again by Reading and lasted in service until 1959. Its body was then donated to number 12 (FHO 604) and the chassis scrapped. What is interesting is that a small and almost unknown bodybuilder was given permission to build an austerity body and it might well have been its sole effort. The year of build was after the initial austerity bodies had been built on ‘unfrozen’ chassis, but before full-scale austerity bodybuilding had got underway. Did Reading come up with its own design or use someone else’s austerity plans? If the latter, the question is whose does it resemble? Photograph Reading Coachworks (from the website below). What clue is there in the fuel pump on the bulkhead? Probably of no significance at all, but the next registration to the original donor vehicle, DK 7792, was a Regal supplied to Yelloway in 1932. The DK registration on the chassis was a Rochdale area plate. Looks like a semi-floating hub at the back, so can’t be later than 1932. And what a well-proportioned body! I lived in the Gosport area as a child from 1949 to 1952, and well remember the Provincial (Gosport & Fareham) Regents. These initially puzzled me as their sound was so unlike the London Transport AECs that I recalled as a very small boy from 1946, when I lived in Selsdon, Croydon. I personally much preferred the Guy/Park Royal bodied Guy Arab IIIs that served the Alverstoke and Haslar Route 11 on which I lived, and the Arab III is still one of my favourite bus types. It is now thought that EHO 282 was a Regent. The Regal had a longer wheelbase than the double deck chassis. The photo indicates that the proportions of the bus are in keeping with those of a Regent, whereas a double deck body on a Regal would have necessitated a short length behind the rear axle to keep within the 26ft overall length limit of the time. One thing I didn’t mention originally was the bespoke double destination blind boxes, a Provincial’ feature, even then. All extra work in austerity times. And are they safety rails high up on the upper-deck front windows? They don’t look like vents or the like. It looks as if there’s a Regal/Regent badge on the radiator grill itself – pity it’s illegible. Thx for the additional comments which have shed some more light on this intriguing bus. And I think most of us echo Roger’s comment about proportion – austerity bus bodies have a charm of their own. And Roger could that also be the explanation as to why the Leon Lion had a centre entrance utility body fitted? I think that you have hit on the answer about the Leon Lion, Chris. Photos can be a bit misleading sometimes, but the picture of the Lion does seem to show that the rear wheel is located directly under the rearmost but one window on this five bay body. The centre bay is decidedly wider than the rest, so that all the other bays are obviously of pretty short length, and the rear axle seems to be located well to the rear of the bus. A centre or front entrance would have been the best solution in the circumstances. The original post mentions Mr Orme-White. I’ve no idea how true it is, but I have been told that Mr White of the Provincial Tramways group (Gosport and Fareham, Portsdown & Horndean among others) was the same Mr White of White’s Removals, and this is the reason behind the removal company’s "sponsorship" of some trams under restoration in the Portsmouth area. I contacted White & Co. (Removals) of Portsmouth, Pete, and, after a period of silence, while the family tree was being consulted, they’ve advised me that there seems to be no connexion between H Orme-White and their family. Now there`s a name to savour! This was a fleet just made for enthusiasts, and my early experiences of being a bus enthusiast are saturated with the delights of this wonderful fleet. I am just amazed that it does not enter these columns on a more regular basis. I remember they had an AEC "Mandator" petrol tanker rebodied as a bus, and have often been tempted to join the Provincial Society, but one cannot be "in everything"
Mention of Mr Orme White reminds me that the family were connected with the Imperial Tramways group, who had interests in Grimsby, Middlesbrough, and , pre Sir Clifton Robinson, with one of my favourite tram fleets, the London United! I think they also had connections with the ill-fated Mid Yorkshire Tramways too. Lets have more Provincial content, and, in the meantime, may I recommend those who are able, to make the journey to Crich, where LUT No.159 is about to be unveiled after a beautiful restoration to its pre-Underground Group condition. As a TMS member, I do have an axe to grind, but it really is a wonderful expression of the art of vintage vehicle restoration, under the professional care of the TMS staff, and the "LCC Tramways Trust". Sorry to go all "trammy"….it won`t happen again! John W is right to applaud the Orme-White family and their link with some great companies such as London United Tramways and the Provincial Tramways Group. I believe the Gosport & Fareham Bus Company running under the name Provincial started in 1929 and replaced the trams. By 1936 they had bought several AEC Regents with Park Royal bodies. Some of these buses were still running in 1963 when I visited Gosport. 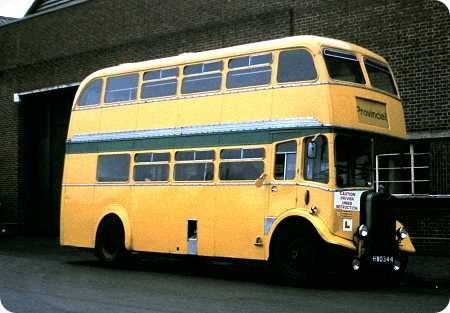 I rode on one of these buses and this experience was magic, as the sound from the AEC crash gearbox was something never to be forgotten. The Provincial Company had some very interesting buses and hopefully someone has some photos to post on this web site. I too, Chris, am captivated by that era of summer coats for drivers, with the odd steam roller about! I don`t quite remember it, but it is of extra fascination because it is close, but not quite akin to our earliest memories. I have always been fascinated by history, especially from the early 19C., when I like to imagine myself involved at the time of my (other hobby) family history characters! I regard the Diddlers as part of the LUT story, and, as such, they have an appeal of their own. I do not think they were particularly attractive vehicles, but that is of no consequence; they were very much an "in house" product of the Underground Group, built "in house" by UCC, and were not intended, design wise, to appeal to the general transport "market", but more intended to resemble the "Feltham" trams. This whole period of tram to trolleybus conversion, and the early days of London Transport provides enough material for years and years of OBP correspondence! I should have mentioned earlier, that the White family, George White in LUT days, were also involved in the early days of Bristol Tramways, which had Imperial Group connections too. I shall look forward to seeing LUT’s 159 at my next visit to Crich, John. It must have been a huge task to recreate all that top deck ‘cast-iron’ alone. At the other end of the spectrum, I have a soft spot for Feltham MET 331, looking much sleeker and stylish than its mainstream cousins. I hold no special brief for London Transport, but what it achieved from its 1933 creation to 1940 was amazing….with sliderules, but without computers!